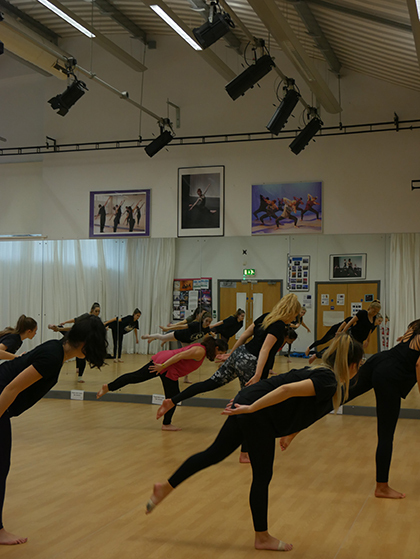 Dance students at The Sixth Form College, Solihull benefitted from a full-day dance workshop this week with a visiting professional dance artist coming into College. Formerly of Motionhouse Dance Company, Sioda Adams now works as an independent dance artist, creating and performing new work. She ran a contact workshop for both Year 12 and Year 13 A level Dance students in the College’s state-of-the-art Dance Studio. The workshop included a contemporary dance class, skill building in contact work and lifting and then a creative session in the afternoon where students put into practice what they had learnt. The techniques that the students learnt in this workshop will help them when they are choreographing their own pieces for A level assessment. They are required to produce solo, quartet and group choreography in a contemporary style as part of the course. The students will be showing off their choreography at a Dance Showcase in College on Thursday 22 March at 7pm in the College Theatre. Tickets for this showcase will be available after the New Year.